New Flyers head coach Alain Vigneault during his time with the New York Rangers. Vigneault, who will become the 21st head coach in franchise history, has over 1,200 games of head coaching experience — and a 648-435-35-98 record — over parts of 16 seasons and has twice reached the Stanley Cup Final. His 648 regular season wins tie him for 12th all-time in the NHL and rank sixth among active coaches. Furthermore, in eight of his 15 full seasons as a head coach, his team has recorded at least 100 points (plus another that posted an equivalent winning percentage in a lockout-shortened season. "It is an honor to be selected as the next head coach of the Flyers," said Vigneault. "The history they have established and the passionate fan base has made this a first-class franchise. I am excited to work with Chuck, the talented group of players, and the prospects coming up through the system in order to return Philadelphia to the top of the NHL landscape." Vigneault, 57, most recently spent five seasons with the Rangers (2013-18), where he led New York to a Cup Final in 2014, knocking off the Flyers along the way, despite it being one of his teams that fell short of that 100-point plateau. 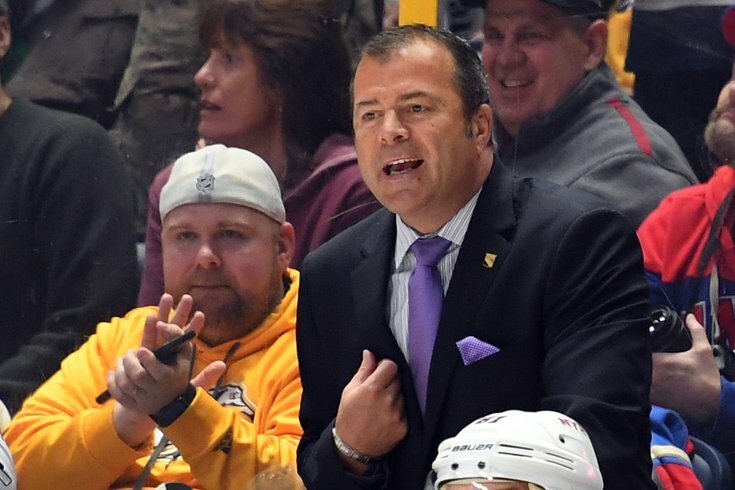 In his career, Vigneault has coached nearly 140 playoff games total. Prior to the Rangers, Vigneault also spent seven seasons as the head coach of the Canucks, the other team he led to a Final back in 2011, when Vancouver racked up an impressive 117 points in the regular season but ultimately lost to the Bruins in seven games. In his first year at the helm for the Canucks, Vigneault was named the NHL's Coach of the Year. Vigneault got his start as a head coach in 1997 with Montreal, where he spent three-plus seasons before being let go 20 games into the 2000-2001 season.